Describe the 5 key parts of a micro-computer. A micro-computer is a machine built with hardware and ran by software. The 5 key parts among the various hardware and software are as follows. 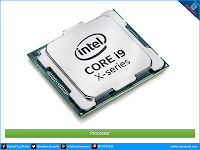 The processor maintains all the operation, so that the processor can carry out the co-ordination with their I/O devices. 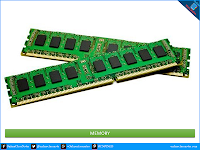 Non-volatile memory such ROM is used to store instructions which are required for the system boot. Read/Write speed of memory devices are higher than storage devices. The devices we use to insert data or signal are called input devices such as keyboard, mouse, microphone etc. 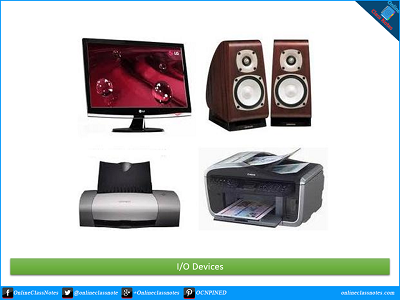 The devices used by the system to show or give us output are called the output devices such as monitor, printer, speakers etc. The micro processor and the memory makes up the closed world and I/O devices open the world to users. Those memory devices where we can store data and the data remains in it even without electricity are called storage devices. Along with various programs and system software, user can also keep, delete, move, update the data in storage devices, while this can not be done in memory devices by the user. There are primarily 2 types of storage devices; one of those are Optical Storage Devices. Optical storage devices are flat, round disks that spins around its center. The difference with magnetic storage device is that in optical storage devices LASER light is used to read and write data in disks. Examples are CD, DVD etc. 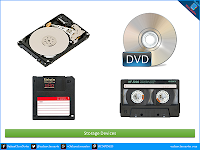 There are two types of optical disks; one that can be written for one time only and another which can be used to write data more than one time, these are called re-writable disks. Some optical disks can store data on both sides of the disk. The most common type of storage device is magnetic storage device. In magnetic storage devices, data is stored on a magnetized medium. Magnetic storage use different patterns of magnetization to in a magnetizable medium to store data. There are primarily 3 types of Magnetic Storage Devices; such as Disk Drives, Diskette Drives and Magnetic Tapes. 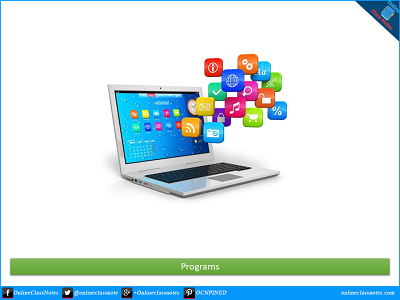 System programs are used to operate a system and application programs are used to perform various tasks such word processing, photo editing, internet browsing etc. A few of the system programs, that a PC needs to manage its operation are permanently built into it such as BIOS program. Read Next: Illustrate the working procedure of the 5 key parts of a micro-computer.